Each RTNS accepted paper requires at least one full rate registration (Academic or Non Academic) before September 12 in order to be included in the proceedings. Each Junior Workshop accepted paper requires at least one additional registration (any kind) before October 01 in order to be included in the workshop proceedings. At least one author of each accepted paper should register before September 13 using a regular registration. Students are required to send an email to rtns2018@ensma.fr with a proof of their status. 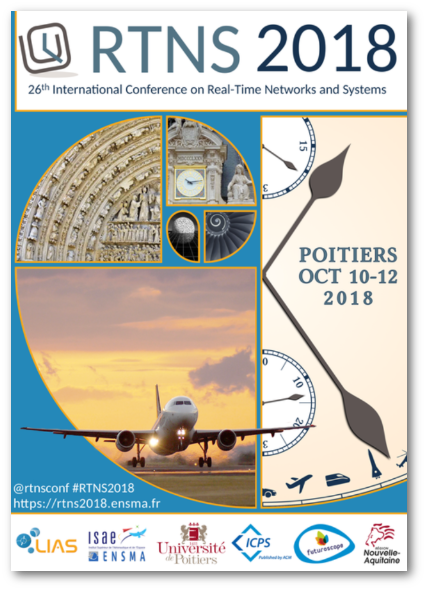 The RTNS 2018 conference registration includes: access to the scientific program of the main conference (October 10-12), the Junior Workshop, conference proceedings and material, coffee breaks and lunches according to the program, welcome receptions (October 10), and the conference dinner (October 11). Purchase order (Bon de commande for French public administrations), after submitting the online registration form you will receive an email with the invoice. For questions concerning the registration process of RTNS 2018, contact the support: rtns2018@ensma.fr.